When tending to open wounds, you want to use a cleanser that is gentle yet effective. The Reliwipe Wound Cleansing Wipes Refill Pack is a great resource that enables you to attend to an injury and prevent the spreading of germs or bacteria before dressing and bandaging. Use these to refill any used up wipes in your British Standard 8599-1 workplace first aid kits. These Reliwipe Wound Cleansing Wipes come in a handy dispenser pack of 20 individually wrapped, alcohol-free disposable wipes. Ordering a minimum of five boxes will give you a total of 100 wipes per order to refill your first aid boxes. Each wipe is soaked in safe and sterile salt water (sodium chloride 0.9%), and is ideal to use for washing an area to stop the spreading of germs and bacteria in a wound. The wipes are made from a soft, damp fabric instead of the traditional crepe or paper, avoiding any irritation at all costs and making them much easier on sensitive skin. They are an excellent way of cleaning out cuts or scrapes before applying bandages or dressings, as they do not contain any abrasive agents or strong odours. These small dispenser boxes are designed to be used with the Small Workplace First Aid Kit, making it easy to restock when you see the need. They come wrapped in individual sachets so that you have the option of taking as many or as little required to treat an injury. 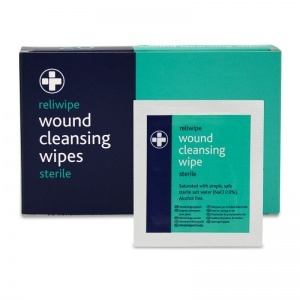 The Reliwipe Sterile Wound Cleansing Wipes Refill Pack is usually dispatched via First Class Royal Mail and delivery should be within 1 to 3 working days.